Fidel J. Tavárez is a scholar of the Spanish Atlantic, focused on issues of political economy, Enlightenment, and imperial reforms during the eighteenth century. He completed a PhD in history at Princeton University (2016). 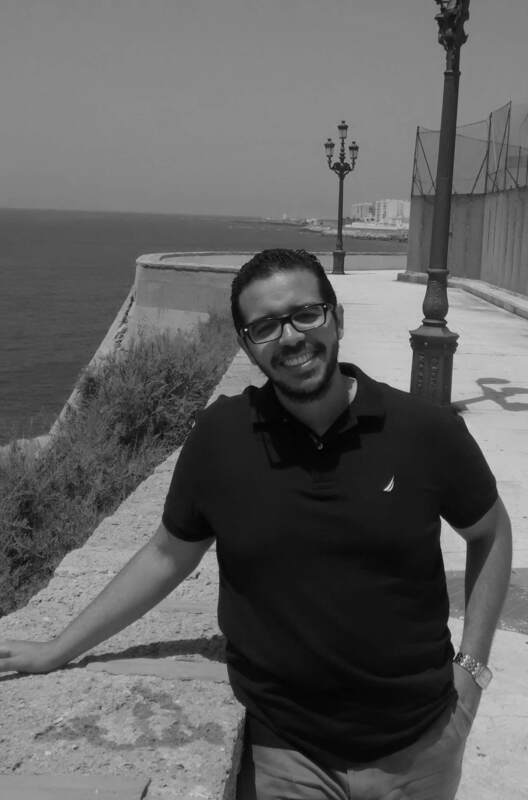 For the 2018–19 academic year, he has been awarded a research fellowship from the Alexander von Humboldt Foundation and will be based at the Freie Universität Berlin. 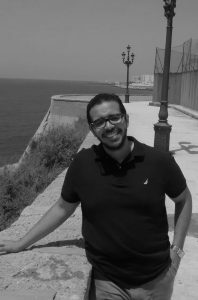 You can read his article “Colonial Economic Improvement: How Spain Created New Consulados to Preserve and Develop Its American Empire, 1778–1795” in HAHR 98.4. 1. How did you come to focus on the New World consulados as an area of research? I did not initially intend to study the New World consulados. I was originally interested in eighteenth-century imperial reforms, particularly concerning Atlantic trade. Like many historians, I simply assumed that the eighteenth-century commercial reforms were designed to undermine the power and privileges of all consulados. Thus, I expected to find that the ministers I was studying for my book project, The Imperial Machine: Assembling the Spanish Commercial Empire in the Age of Enlightenment, would be adamant about abolishing all corporations and the vested interests they often represented. To my surprise, I discovered—while conducting research at the Archive of the Indies—that key ministers like Floridablanca and Francisco de Saavedra actually promoted the creation of new consulados in the 1780s and 1790s. I subsequently began to wonder why these so-called Enlightenment ministers advocated for the creation of new consulados across Spanish America while also railing against commercial privileges and monopolies. How was it possible to disparage privileges and monopolies while advocating for the creation of new consulados, or what some historians call merchant guilds? My article is an attempt to answer this puzzle. It turns out, I later came to realize, that I was making a mistake in thinking that consulados were necessarily particularistic corporations designed to entrench commercial privilege and monopoly. To be fair, it is true that the wealthy merchants of the consulados of Mexico, Lima, and Cádiz had a tremendous amount of power and leverage with the monarchy. But, as Jeremy Baskes has convincingly demonstrated, this did not automatically lead to robust monopolies. In a context of tremendous uncertainty, consulados, like the highly regulated fleet and galleon system of trade, were designed to keep risk at bay. Moreover, as Xabier Lamikiz has demonstrated, the consulado structure did not always dictate the nature of transatlantic trade. With the emergence of more competitive patterns of trade starting in the 1740s, a host of merchants also established tight networks and flows of information outside of the traditional structure of privilege and rivalry between the consulados of Mexico, Lima, and Cádiz. With these new perspectives in the background, I later discovered that the new consulados of the 1790s were explicitly designed to expand, not monopolize, trade. In fact, contemporaries argued that the new consulados would actually empower a host of merchants of the middling sort while undermining the wealthy and powerful merchants of the old consulados of Mexico and Lima. Many suggested that commercial exchange would be expedited as a result of the creation of new consulados, for these new institutions would presumably reduce the time and money spent in solving commercial disputes. Rather than having to waste precious resources going to the consulados of Mexico and Lima to solve commercial disputes, merchants would have access to merchant courts in most of the major port cities of the empire. And last but not least, the new consulados were also expected to work in concert with the economic societies to design and implement improvement projects and to develop infrastructure. For these reasons, I decided that the term historians have traditionally employed to describe the consulados, “merchant guilds,” is inadequate at best. Instead, I opted for the more neutral term “merchant chambers” or “chambers of commerce.” By adopting these terms, I do not mean to suggest that merchants in these institutions never intended to create monopolies. Instead, the term is flexible enough to accommodate the fact that the wealthy merchants in the consulados of Mexico, Lima, and Cádiz often had aspirations of expanding their control over transatlantic trade, while also understanding that they were seldom able to do so and that the new consulados of the 1790s were explicitly chartered to undermine privilege and expand commercial exchange across Spain’s empire. Tavárez’s article intervenes in a debate over the Bourbon reforms aired in HAHR in 1977–78. 2. Your article makes an intervention into a debate over the Bourbon reforms aired in the pages of HAHR. How did you come across this debate, and what was its significance for your research? 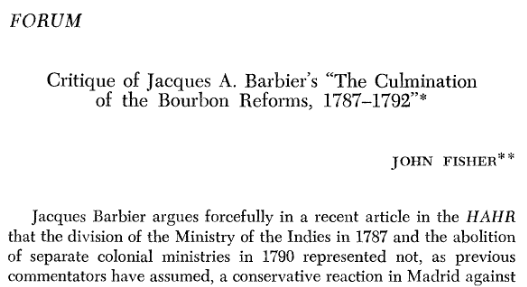 Of course, since Barbier’s article many new insightful perspectives on the Bourbon reforms have seen the light. Barbara and Stanley Stein, for instance, have argued that Spanish ministers were attempting to adjust, not drastically transform, the empire’s gothic edifice. Still, the Steins, like most historians of the Bourbon reforms, assume that all ministers shared a particular vision of reform. Attempting to periodize the Bourbon reforms from beginning to end, scholars like Kenneth Andrien, Allan Kuethe, and Adrian Pearce have suggested that the Bourbon reforms did not begin with the reign of Charles III in 1759 but rather with Philip V during the first half of the century. These scholars have undoubtedly conducted an impressive amount of research to show the dynamism of the earlier period. In my view, however, they continue to assume that the Bourbon reforms were a coherent project of state centralization and colonial extraction. While it is true that some ministers did want to increase political control over the colonies and extract more tax revenue from them, this was not the only, or even the most far-reaching, ruling ideology among Bourbon ministers. For some ministers, it was more important to stimulate colonial economic improvement, integrate the imperial economy, and create a system of intraimperial reciprocity that allowed Spanish subjects from both hemispheres to work in concert in stimulating economic growth. 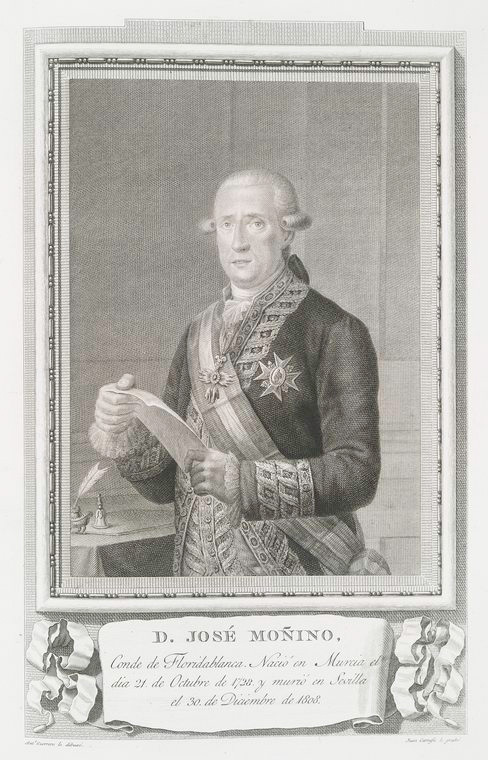 José Moñino, conde de Floridablanca—a key advocate of the soft imperialism traced by Tavárez. From The New York Public Library (the original may be found here). 3. Your article works to make a distinction between what you term extractive and soft imperialism. How does your article’s intervention revise our understanding of the Spanish empire? This is a very pertinent follow-up question. As I mentioned before, it is true that some ministers did, in fact, wish to intensify the metropole’s control over the colonies both by removing creoles from office in the New World and by extracting more taxes from colonial subjects. Led by none other than José de Gálvez, this group of ministers advocated for a ruling ideology that I call extractive imperialism. However, the more far-reaching and innovative imperial reforms were inspired by ministers who wanted to integrate colonial subjects into Spain’s project of economic modernization on a more reciprocal basis. Advocating for a ruling ideology that I call soft imperialism, these ministers understood that the economic and political future of the empire depended on the commitment of its subjects in both sides of the Atlantic. Hence, rather than extract more taxes from the colonies, these ministers sought to promote colonial economic improvement. Not only were they convinced that by pursuing an extractive system they would alienate colonial subjects, but they also understood that the empire’s economic future depended, in large part, on the dynamism of colonial economies. As I will detail in my ongoing book project, the most innovative institutional reforms came from ministers who advocated for soft imperialism. While comercio libre, for instance, was implemented in most of the empire in 1778 with Gálvez at the helm, the project had much earlier origins among the advocates of soft imperialism. Gálvez also did not follow the blueprint of reform designed earlier. Rather than implementing comercio libre in the entire empire, as the advocates of soft imperialism had suggested, Gálvez decided to exclude New Spain. Moreover, unlike Gálvez, who preferred to extract more taxes from the colonies, the advocates of soft imperialism called for the creation of a national bank to finance the war against Britain between 1779 and 1782 while also promoting trade and economic dynamism. As I explain in my article, the creation of new colonial consulados must be understood as part of this program designed to promote colonial economic improvement and reciprocal bonds between Spanish subjects from both side of the Atlantic. And lastly, the partly successful efforts to create economic societies across the empire were also part of this imperial program designed by the advocates of soft imperialism. The implications of my argument for our understandings of the Spanish empire are many. Most importantly, it shows that during the 1780s and 1790s Spain conducted one of the most ambitious experiments with modern commercial imperialism in the Atlantic world. Not only did the Iberian polity seek to stimulate economic growth, but it attempted to do so by instituting a new imperial system in which all of Spain’s territories worked in concert, thus creating reciprocal bonds between subjects from both sides of the Atlantic. This ambitious experiment, of course, was not entirely successful. It should make us reconsider, nonetheless, the monolithic image of the Spanish empire that we have inherited from the Black Legend. 4. 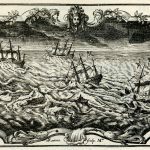 This article stems from your recently completed dissertation, entitled “The Commercial Machine: Reforming Imperial Commerce in the Spanish Atlantic, c. 1740–1808.” What advice would you give to early career researchers about translating one’s dissertation research into a publishable article? There are many things one can say in response to this question, but let me focus on one aspect that I think has been most helpful to me. When I plan to write an article or a larger project, I always begin with a question or historical puzzle. The question may be one that has already been addressed by the extant historiography, or it may be a puzzle that arises from reading primary sources. To me, this is the key to writing a good article, dissertation, or book. It must be an answer to a historical question of significant import for you and the people in your field. With a clear question in mind, you can easily identify the kind of research and sources you need. You can also easily identify the parameters of the project, that is, the themes and issues which must be discussed. And, last but not least, a clearly defined research question allows you to integrate the relevant historiographies into your argument. In advocating for clearly defined questions, I am not entirely dismissing the benefits of open-ended research and exploration. Quite the contrary, more often than not good historical questions begin with a puzzle one encounters while reading primary sources. However, before you write a successful publishable article, you must have developed a clear, important, and compelling historical question. In my mind, this is how a successful article, or scholarly project, begins. Having mastery about a given subject is important, but it alone will not get you published. Erudition is simply not enough. You must offer a compelling account for a given historical question or puzzle. Yes, I have been reading the work of the late Joyce Appleby, especially her book on the history of capitalism: The Relentless Revolution: A History of Capitalism (2010). While scholars might quibble over some of the details, Appleby masterfully synthesized scholarly works in an accessible way in order to make a compelling argument about the origins and diffusion of capitalism across the globe. Rather than a natural outgrowth of commercialization, transformations in relations of production, or the accumulation of capital, Appleby argued that capitalism also was a cultural system that arose under very particular circumstances in seventeenth-century England. Alongside Appleby’s book, I am also reading Carl Wennerlind’s Casualties of Credit: The English Financial Revolution, 1620–1720 (2011), Koji Yamamoto’s Taming Capitalism before Its Triumph: Public Service, Distrust, and “Projecting” in Early Modern England (2018), and Arnaud Orain’s La politique du merveilleux: Une autre histoire du système de Law (1695–1795) (2018). While these books have different points of departure, they all provide compelling arguments for the rise of capitalism as a cultural system. These works also show that, in spite of what some modern economists might tell us today, the emergence of capitalism in the early modern period is a story of synergy between statesmen, merchants, political economists, and intellectual entrepreneurs. This is the perspective I hope to apply to the eighteenth-century Spanish Atlantic, a geographical field that has been excluded from these conversations, in large part because of scholar’s insidious assumptions concerning the supposed backward and mercantilist nature of the Spanish empire.